With the BJP now in direct or indirect control of 22 states, and in the process of creeping up to majority status in the Rajya Sabha to add to its overwhelming numbers in the Lok Sabha, the question of what the party intends to do with its dominance assumes urgent importance. A close reading of the works of its principal ideologues, notably Deen Dayal Upadhyaya, suggests that — as I had earlier explained in ThePrint — amending the Constitution is likely to be high on the ruling party’s priority list. Whether or not the BJP goes full tilt at rewriting the entire Constitution to establish the ‘Hindu Rashtra’ of its dreams (which may still require numbers it doesn’t have in the RajyaSabha), an obvious first step in that direction is probable. The easy target our ruling party may aim at is to reverse the 42nd amendment of the Constitution, which in 1976 added two words the BJP doesn’t like — ‘secular’ and ‘socialist’ — to the Preamble. ‘secular, federalist, socialist’ in the Preamble. In the eventual compromise, the majority of the assembly took the view that the Indian state would indeed be secular but that it was not necessary to use the word in the Preamble. The word “secularism”, after all, was explicitly Western in origin, emerging from the political changes in Europe that accompanied the ‘Protestant Reformation’ and the era called the ‘Enlightenment’. But many 20th-century leaders outside Western Europe were attracted to the concept, notably Kemal Ataturk in Muslim-majority Turkey and Jawaharlal Nehru in Hindu-majority India, both of whom saw a secular state as a crucial hallmark of modernity. In India’s case, secularism also seemed to Nehru the only way to avoid the religious and communal antagonisms that had partitioned the country when the British left. The Constituent Assembly debates show the extent to which this logic was accepted by our founding fathers. “I accepted this secularism in the sense that our state shall remain unconcerned with religion, and I thought that the secular state of partitioned India was the maximum of generosity of a Hindu-dominated territory for its non-Hindu population,” said Lokanath Misra in the debate on December 6, 1948. Still, the adoption of Articles 25, 26, 27 and 28 of the Constitution, guaranteeing freedom of conscience and the right to profess, practise, and propagate one’s religion, to manage one’s own religious affairs, and to enjoy the freedom of religious worship, confirmed that the concept of secularism was unarguably implicit in India’s constitutional philosophy. But it wasn’t Western-style secularism, which meant irreligiousness, which even avowedly atheist parties like the communist ones or the southern DMK party found unpopular among their voters. (Indeed, at Calcutta’s annual Durga Puja, the communist parties compete with each other to put up the most lavish Puja pandals.) Rather, secularism meant, in the Indian tradition, a profusion of religions, none of which was privileged by the state. The theory of secularism, as Prof. R.S. Misra of Benares Hindu University has argued, is based on dharma-nirpekshata (‘keeping apart from dharma’), which is impossible for any good Hindu to adhere to. BJP politicians like Rajnath Singh and Yogi Adityanath have argued that Indian governments cannot observe dharma-nirpekshata but should follow the precept of panth-nirpekshata (not favouring any particular sect or faith). In this they are not far-removed from my argument — which I have made for several years before my entry into Indian politics — that ‘secularism’ is a misnomer in the Indian context of profuse religiosity, and what we should be talking about is ‘pluralism’. I believe the roots of India’s pluralism can be found in the Hindu philosophy of acceptance of difference: ekam sat vipraabahudhavadanti, the truth is one but the learned call it by many names. But many Hindutva-minded critics of secularism are not terribly enamoured of pluralism either. Pluralism, however, has meant the active encouragement of religion, in defiance of classical secular theory. Indian secularism cheerfully embraces financial support to religious schools and the persistence of ‘personal law’ for different religious communities; it has created the reservation system for underprivileged Hindu castes, and promoted the directive principle of cow protection, both of which enjoy Constitutional sanction. The Indian system has created incentives for various religious denominations to start and operate ‘minority schools’ and colleges with substantial government funding, impart religious education, and be exempt from various regulations and stipulations the Indian government imposes on non-minority institutions. (Indeed, while government schools and colleges may not impart religious instruction, religious sects and charities affiliated to minority communities may open their own schools and receive state financial assistance even as they impart religious indoctrination). Under the Indian version of secularism, the government’s financial largesse is extended to the Muslim waqf boards, Buddhist monasteries, and certain Christian religious institutions; and under a 1951 religious and charitable endowment law, state governments are empowered to take over, own and operate Hindu temples, collect revenue from offerings, and redistribute that revenue towards such purposes as it deems fit, including any non-temple-related ones. The Hindutva brigade does not like this, and it is determined to do away with it as a significant step towards its project of transforming India into a Hindu state, or at least a state with a distinctively Hindu identity. 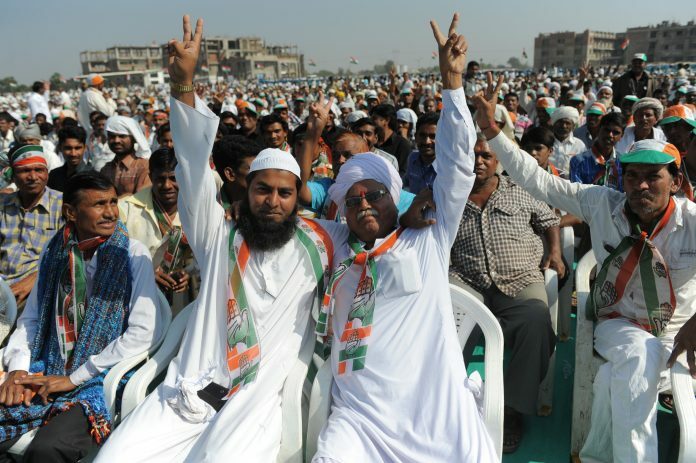 To hear their point of view is to take in a host of factors — the uncritical acceptance by the Indian establishment of regressive practices among the Muslim community while demanding progressive behaviour from Hindus, the support for minority education while denying such aid to Hindus, the promotion of ‘family planning’ among Hindus but not among Muslims, the cultivation of ‘vote banks’ led by conservative Muslim leaders but the disparagement of their Hindu equivalents, and so on. The result is a widespread denunciation of the “appeasement” of Muslims, which seems bizarre when one looks at the statistical evidence of Muslim socio-economic backwardness and the prevalence of discrimination in such areas as housing and employment. Muslims are under-represented in the nation’s police forces and over-represented in its prisons. Yet Hindutva leaders have successfully stoked a perception that government benefits are skewed towards minorities, and thus justified their campaign for Hindu self-assertiveness. It is for such reasons that Deen Dayal Upadhyaya had argued that secularism would have to go: in his words, it “implies opposition of Hindus and appeasement of Muslims or other minorities. We should get rid of this word as soon as possible. It is completely irrelevant in the Indian context”. One can credibly argue that the 42nd amendment merely put a word into the Constitution whose spirit was always deeply embedded in it, and reified in governmental practice. The loss of the word ‘secularism’ will not necessarily make the country less secular, since successive Indian governments had practised the peculiar Indian variant of secularism anyway before the42nd amendment. Nor can we protest a further amendment to a Constitution we have already amended a hundred times before. As Anantkumar Hegde, MoS for skill development & entrepreneurship, has unambiguously declared: “The Constitution … will change in the near future. The Constitution has changed many times before. We are here and have come to change the Constitution.” But this is no ordinary amendment — it attacks something fundamental and intrinsic to the way our Constitution-makers intended India to be. The opposition must and will resist the BJP’s attempts not because the word itself is essential, but because its removal will symbolise an assault on the spirit of Indian pluralism and religious freedom — which was not created by the Constitution but reflected in it. Even if we fail in preventing the removal of a word, we must never stop fighting to preserve its spirit in the political practice of our country. Secularism in practice means the right to live and let live, irrespective of the religious identity. The foremost trait of a secular person is that he / she conducts himself / herself on the priniciple of Insaniyat and does not believe in the supremacy of one’s own religion over the other. 1) Some Muslims still believe that Hindus are kafirs and encourage conversions of Hindus to Islam. 2) Where- ever muslims are in majority they do not let others survive; through coercion and other despicable means. Kashmir valley is pointer to this and Indian state has forgotten the sacrifice of Guru Teg Bahadur for this cause. 3) Why should largesse be given to anyone based on the faith? 4) Is it not a fact that muslims are denied access to good education by the fundamentalists amongst them and are thus don’t get out of the fanatic mindset? Mr Shashi Tharoor likes of you are not serving the country but are working for selfish ends. Pl get out of this siezed mentality and work on the principle of Insaaniyat. first your party needs to exist at all to oppose it. More importantly, you are explaining the tenants of appeasement politics, the one bane of this nation that has taken it down toilet drain politics. I second Mr.VC,.. very true and to be taken into consideration. Mr. VC, as regards Q. 1, as per Keshavananda Bharti vs. State of Kerala, a 13 judge bench of the SC deemed that the “Basic Structure” of the constitution cannot be altered. I invite you to google the same. That said, it is not improbable that a pliant 15 judge bench can be found to overturn this judgement given the governments attempt to have a greater and probably a partisan say in judicial appointments. This is a matter of grave concern for one and all. I find this a nicely written article on the subject esp. liking the fact that you have quoted the views of the Opposition Ideologist without bias, while making and not losing your point of argument in its light. This made it a wonderful read for the sheer balance of approach. And I am thankful for the print to have made it available to ordinary citizens through its page. While not as much as this article, but if I may, I would like to draw attention of yours to two pertinent questions related to constitutional amended and readers like me to further the discussion. Will you be kind enough to post a response, or drop a mail to my Inbox. Yours thoughts and feedback will be much appreciated. 1. Is anything or everything in the Constitution be kept open for Amendment ? What if everytime a Govt is elected, it amends the actions of Previous Govt? And if this goes in a cycle? Is their any restriction and safeguard? Or will it be called the Beautiful Sways of the Democracy and people of the country will be tuned to dance along forever? 2. As the political situation is developing in the States especially down in the South and the general voting public mood is moving distance away from BJP unlike in 2014, there is a growing possibility of repeat of the early/ mid 1990s scenario when there was no national party that could claim the mantle of power at the Center. Then supposing for argument that if 2019 election throws up a Regional Party Coalition Front to Power, do you think such event could avert this Amendment crisis and potential threat to the Constitution ? As the States are coming out with their own regional agendas with demanding larger say and federal powers delegated to them, will such Power directly given into their hands, lead to further degradation of social balance and fuel regional instability amid internal power struggles of the coalition? How do you see that future post 2019 elections supposing people denied either the BJP or Congress a full majority in the house? Secularism is not just a word, much less a superfluous one. It is one of the basic features / structure of the Constitution, which cannot, by virtue of an important Supreme Court judgment, be altered. Inserting socialism and secularism in the Preamble may have been part of Mrs Gandhi’s emergency enterprise. However, removing that word, at a time when majoritarian impulses abound, would be deeply problematic. It would almost certainly be struck down by the apex court.